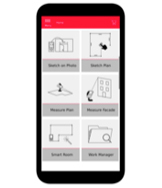 The​ Leica DISTO Plan app connects to your Leica DISTO via Bluetooth & increases your productivity by making it easy to automatically create highly accurate sketches & plans. 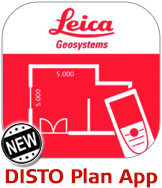 Create plans using intuitive tools & measure them with your Leica DISTO using distance measurements or P2P technology. Leica DISTO Bluetooth Smart technology allows you to assign distance measurements to the appropriate part of a photo taken with your tablet or smartphone. Create detailed plans which automatically scale with your DISTO measurements, add wall openings and even view it as a 3D model. Create a sketch on your smartphone or tablet & then assign distance measurements taken with your DISTO to each line. The app’s ‘auto-scale’ function adjusts the lines’ length& the result is a scaled, CAD ready plan. Simplify your daily workflow with the new Smart Room Function. 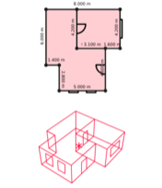 Create floorplans by taking clockwise or anti-clockwiase measurements of the room. 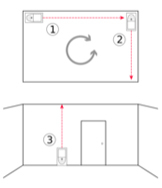 Create CAD ready floor plans with your Bluetooth DISTO simply by taking clockwise or counter-clockwise measurements of a room. Once all measurements are taken, the app’s Smart Room Function automatically generates the plan. The fastest 3D capturing process with easy to use 2D results. P2P technology makes it possible to measure detailed floor & wall plans, including doors & windows. You can export your plans from devices which support this functionality as dxf or dwg files directly into your preferred CAD solution. 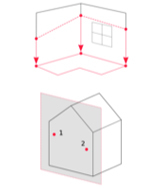 The DISTO Plan App’s ‘Measure Façade’ function makes it easy to measure points which are hidden behind objects. Simply take your measurements & the app then automatically calculates the hidden points. Begin your digital construction process by exporting your plans in DXF or DWG. Share & archive plans, photos and high resolution jpg and create detailed PDF reports. This entry was posted on Thursday, June 7th, 2018 at 3:36 pm	and is filed under DISTO + Bluetooth, Leica DISTO D110, Leica Disto D210, Leica DISTO D510. You can follow any responses to this entry through the RSS 2.0 feed. You can leave a response, or trackback from your own site.